After the recent problems in the streaming world having led to temporary suspensions of most of Anime On Demand's titles for the Autumn anime season, I had been worried that Magi's delayed stream might also be affected. Having stoically waited through all of my Japanese friends discussing it on Twitter, and having turned a blind eye to the entitled leeches in the UK fan community who couldn't wait a few extra days to enjoy the series legally and support its local stream, the prospect of another wait wasn't too desirable. It turned out that it was delayed another day. Fortunately, common sense prevailed in the end, and for now at least Magi has successfully made its UK streaming debut on Anime On Demand. Unfortunately, having come out on a Thursday this week meant that it was necessary to divide excitement between both Magi and Kintama, even before taking other great series into account! I was raised in an era where the Arabian Nights were a frequent source of inspiration for books, television and movies. Before Disney's Aladdin became the definitive Arabian Nights experience for a generation, and before pervasive Islamophobia took hold in the west, the One Thousand and One Nights was one of the classic settings for stories of adventure and magic. With swashbuckling, mystery and a huge cast of characters to draw from, I have nothing but fond memories of growing up hearing about the exploits of Sinbad, Ali Baba and the others. Ootaka Shinobu's Magi: The Labyrinth of Magic anime therefore had instant appeal even before taking into account its creator's hand in the well-received Sumomomo Momomo series and Magi's own impressive popularity within BL fandom. Set with the Arabian Nights as a backdrop, here Aladdin rubs shoulders with familiar characters from the old stories in a whimsical original adventure. The casting is good, with Morikawa Toshiyuki's masculine voice being lent to the strange-looking Djinn, Uugo-kun, a particularly amusing choice. 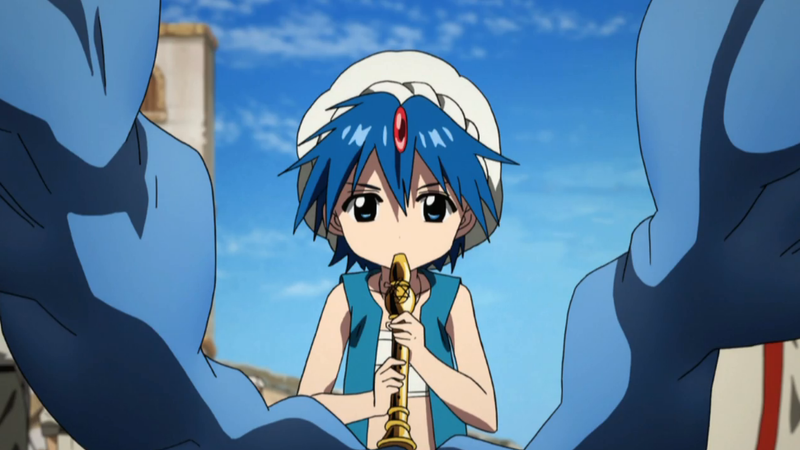 Aladdin himself is absolutely adorable, a tiny young boy with a surprising capacity for wisdom when it's needed. The main focus of this first episode is his meeting with a slightly cynical, but rather heroic version of Ali Baba. The two work well together and it looks as though their story will be a fun one to watch in the coming weeks. The only complaint I could make is that the stream's audio quality didn't seem quite right, as though it was struggling with bandwidth. If this persists when I give the second episode of K a look tomorrow, I'll try fiddling with my browser settings to find out what's going on. Bizarrely the manga has yet to receive any kind of English release in the west to date, something which will hopefully change with the boost in demand from the anime adaptation. I'm tempted to pick up the Japanese tankoubon in the absence of an English edition in order to peep ahead between episodes. Magi: The Labyrinth of Magic is (finally) streaming for free through Anime On Demand. I thoroughly recommend taking a look.